Astronomy is older than physics. In fact, it got physics started by showing the beautiful simplicity of the motion of the stars and planets, the understanding of which was the beginning of physics. 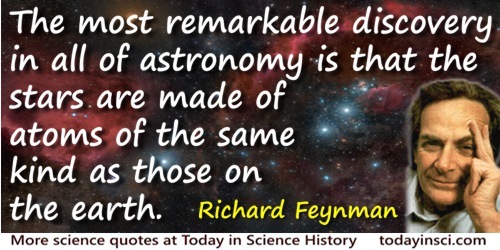 But the most remarkable discovery in all of astronomy is that the stars are made of atoms of the same kind as those on the earth. In 'Astronomy', The Feynman Lectures on Physics (1961), Vol. 1, 3-6. God was always invented to explain mystery. God is always invented to explain those things that you do not understand. Now, when you finally discover how something works … you don't need him anymore. But … you leave him to create the universe because we haven't figured that out yet. Interview, collected in Paul C. W. Davies and Julian R. Brown (eds.) Superstrings: A Theory of Everything? (1988), 208-209. The problem is not to find the best or most efficient method to proceed to a discovery, but to find any method at all. We are very lucky to be living in an age in which we are still making discoveries. It is like the discovery of America—you only discover it once. The age in which we live is the age in which we are discovering the fundamental laws of nature, and that day will never come again. It is very exciting, it is marvelous, but this excitement will have to go. From transcript of the seventh Messenger Lecture, Cornell University (1964), 'Seeking New Laws.' Published in The Character of Physical Law (1965, reprint 2001), 172.